Summary: Alice had her whole summer planned. Non-stop all-you-can-eat buffets while marathoning her favorite TV shows (best friends totally included) with the smallest dash of adulting–working at the library to pay her share of the rent. The only thing missing from her perfect plan? Her girlfriend (who ended things when Alice confessed she’s asexual). Alice is done with dating–no thank you, do not pass go, stick a fork in her, done. Review: Note: The first chapter of LTAL is the breakup mentioned in the summary, and it includes aphobic and racist comments by the ex-girlfriend. In addition to these, LTAL also includes a brief sexual harassment scene. The first time I saw the cover and read the summary of Claire Kann’s debut, LET’S TALK ABOUT LOVE, I knew I had to get my hands on it. A black, biromantic, asexual teenager in college? Yes please! Within the first couple of chapters, I knew I was going to enjoy going on this adventure with Alice. Alice has a distinctive voice filled with quirky commentary and parenthetical asides, which I generally enjoyed (though at points the pop culture references got a bit tiresome). Her narration was compelling and gave me a good idea of how she viewed the world and herself, especially in this tumultuous period in her life. One of the things I really appreciated about LTAL is that Alice is explicitly biromatic and asexual, and Alice spends a lot of time thinking about and (sometimes) talking about her asexuality. (There’s even some discussion of asexuality as a spectrum.) Alice is out to just a handful of people, and after the disastrous end of her previous relationship, she’s reluctant to start a romantic relationship with Takumi even though she falls for him hard. 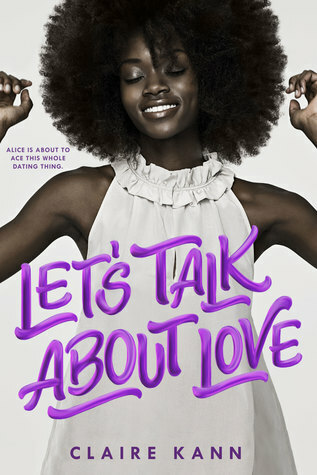 Throughout the book, Alice pushes back against aphobic rhetoric that says her love isn’t “good enough” compared to someone who wants a sexual relationship with their partner. Alice’s relationship with Takumi was pretty cute. I had some specific-to-my-taste complaints, but overall, I enjoyed the long buildup of their friendship and watching the two of them become closer. (I do wish we’d seen more of their adventures together, though. There were some things I wanted to see play out on the page instead of being told about them later.) I’m rather fond of do-I-confess-and-risk-our-friendship romances, and the stakes felt even higher with Alice so recently burned by her ex-girlfriend’s reaction to Alice’s asexuality. Alice and Takumi’s relationship was filled with ups and downs, hurt feelings and happy times, but the ultimate resolution was satisfying. Recommendation: Buy it now if you’re a fan of contemporary romance. Alice is an entertaining narrator with a strong voice, and you’ll quickly become invested in her getting a happily-ever-after. LTAL doesn’t shy away from addressing anti-black and aphobic microagressions, and it also tackles conflicts between parental expectations and children’s happiness. If you’re looking for a cute, sweet romance with some staying power, you should read Claire Kann’s debut.